Mathematical and multi-physics simulation package for aerospace engineers now includes library of fuel system models. ESI Group has entered a partnership involving its model-based simulation subsidiary, ESI ITI, and Modelon. The companies will join forces to support industrial manufacturers in delivering innovations at a faster pace and reduced cost. Modelon’s comprehensive suite of Modelica-based libraries, a reference in the field of systems engineering, will be progressively integrated into ESI’s SimulationX, the software platform for simulating multiphysics systems. As a first step, the forthcoming version SimulationX 3.9.3 will feature Modelon’s Fuel System Library, dedicated to the aerospace sector. The availability of this new library will contribute to the early prediction of systems behaviour for various operating modes and flight conditions. 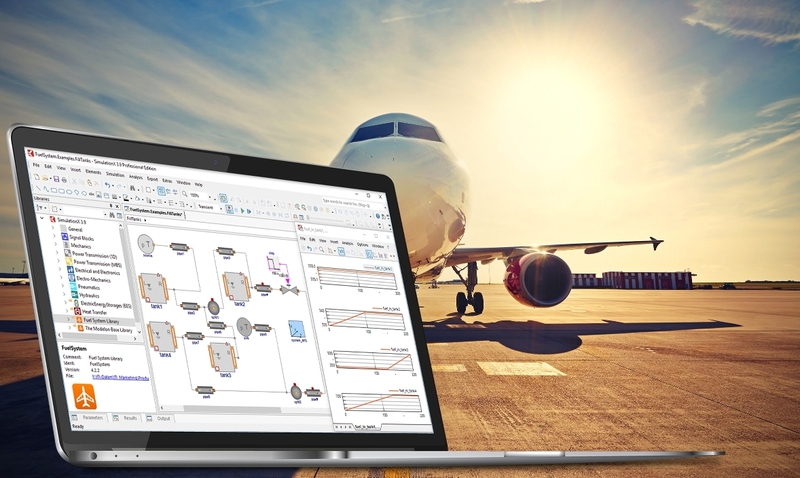 Swedish company Modelon offers a comprehensive suite of libraries for system modelling that delivers state-of-the-art system models for a wide range of industries, including the automotive, aerospace, industrial machinery, energy and processing sectors. Modelon’s libraries are built on the Modelica standard, a modelling language allowing engineers to reuse and exchange dynamic and mechatronic system models throughout different software applications. The Fuel System Library to be implemented into SimulationX 3.9.3 enables engineers to design aircraft fuel systems with real-time capable models, including gravitational and geometrical effects as well as air-fuel mixtures. The library is intended for the analysis and verification of a system’s behaviour during various dynamic operating modes and flight conditions. The Fuel System Library is a versatile tool for system and component development and allows the assessments of system performance and transient characteristics. The models have been designed to be efficient and numerically robust and can therefore handle complex large-scale systems. Component models include ejectors, pumps, tanks, valves and pipes.